The Multi-headed Dragon tells bedtime stories for his three-headed baby offspring, about a heroic knight named Krisztofóró and his none less heroic steed, Seven of Clubs. 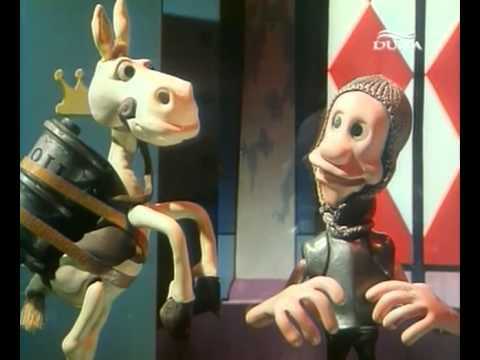 Krisztofóró is a claymation TV show that aired between 1989 and 1994. It has 52 episodes most of them around 5-8 minutes long. They used to air these as bedtime stories, so I remember the song and the sleepy baby dragon quite well. 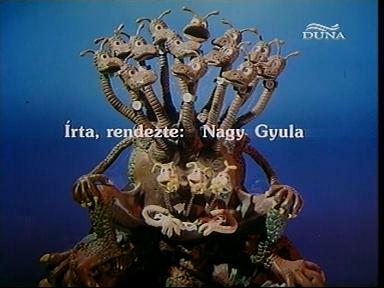 Every episode is narrated by Papa dragon, and they all end with one of his 13 heads shushing the others: "Shhhhhhh! They are already asleep!" Also, each head of Baby Dragon gets its own pacifier. Obviously. Most of the stories are short and silly, detailing the adventures of Krisztofóró and his talking horse. In the "Big-Tooth Monster," for example, they end up venturing into a castle where people are very proud of everything (chicken, garbage dump, the city in general) claiming they are all gigantic even though they are normal sized. They "honor" Krisztofóró by designating him to fight the Big-Tooth Monster, something so terrible that all the people of the castle flee at the mere mention of it... The monster, obviously, turns out to be a mouse, which Seven of Clubs chases away by making cat noises. The mouse runs away yelling "Did no one inform them that I am terrifying?!" You can find this episode, and some others, on YouTube. All in all, it is a cute and silly children's show, with fun claymation, narrated by a dragon. What's not to love? These are the things that drive me crazy....Multi-headed Dadi Dragon that tells story's to a three headed baby dragon? how...what? how does it even...? Ok I give up. Seven of Clubs? Great name. 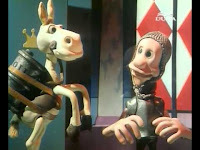 This is amazing, hysterical, and so much more inventive than most kids shows I know of! Fun! Great! I will need to show this to my oldest son. He created a three-headed dragon for our D&D games, but this dragon is totally evil. "Did no one inform them I am terrifying?" - LOL - I shall have to remember to use that one :) Love it.